On the hardware side of things, the Meizu MX3 has an 8 megapixel camera module for a maximum image resolution of 3264 x 2448 pixels and an LED flash. The camera has a 1.4 µm pixel size and the aperture is a wide f/2. The single LED flash can be used to shoot video in poorly lid conditions or facilitate low-light photography. As with many of its competitors, Meizu has went with a unified camera and camcorder interface, featuring a big virtual shutter button for stills and a smaller camcorder shutter above it for video. This makes framing a video very tricky because you get the 4:3 aspect viewfinder, which then turns into a zoomed in 16:9 video one. Everything in the Flyme camera app is located on the right side. You get a shortcut to switch shooting modes - Auto, Panorama, Macro, Text and Beauty. The other settings you get are ISO, White Balance, Capture Setting and Record Setting. There's no Wide Dynamic Range this time, which was Meizu's proprietary HDR mode. You can use the volume rocker to capture images with the camera. Unfortunately, it is of no use for auto-focus, with which we had issues. Sometimes the MX3 was hesitant to focus and the viewfinder stayed blurry until we touch-focused it. You can tap and hold the virtual shutter though and the phone will autofocus before taking the shot upon releasing the virtual button and continuous autofocus is available too. A really cool feature of the MX3 is called Gesture capture and it allows you to snap a photo by putting your hand the top part of the phone. It works with the built-in proximity sensor and lets you snap a photo without touching the screen and introducing unnecessary camera shake. The images captured with the Meizu MX3 have very pleasing amount of details for the 8MP league and nice contrast. Colors turn out pleasing and the white balance was spot on. The noise levels are way too high, though, which is our main issue with the camera and somewhat damages the whole experience. The other thing is the over-enthusiastic metering, which results in the occasional over-exposed shot. The MX3 has a dedicated Macro mode and decided to test it out. The results we got are very impressive. The smartphone lets you get really close to the subject and capture really fine detail. The short minimum focus distance, along witht he bright aperture also enable you to produce nicely blurred backgrounds - something mobile phones are always struggling with. The Meizu MX3 also offers Panorama mode, but we are far from impressed by its performance. The panoramas on the Meizu MX3 came out really fast but the detail level is really low when compared to the still images and the resolution is hardly spectacular at 10MP. We've enrolled the Meizu MX3 into our photo quality comparison tool where it will do battle with the likes of the LG G2 and Galaxy S4. You can choose any other smartphone adversary you like so go nuts. In a world filled with smartphones capable of 60 fps shooting at 720p and 1080p and 120 fps shooters at 720p, and even 2160p 4K video capturing, the Meizu MX3 goes for a rather pedestrian 1080p@30fps. 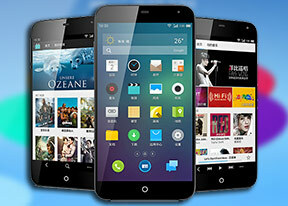 The Meizu MX3 records FullHD videos at 1920 x 1080 resolution with a framerate of 35 fps. That's not all, the bitrate of the videos is a whopping 100 Mbps, which to put in perspective is twice the bitrate of the Samsung Galaxy Note 3's 2160p video and around 4 times the 1080p bitrate of said phablet. That's whopping and from a technical standpoint it's very impressive that the MX3 can actually record at this insane bitrate. However, in real life this means that 11s of video is around 100 MB, which can be really problematic when you don't have expandable storage. And while the lack of compression saves you some artifacts in your videos, we are certain a better balance could be struck between those. If the bit-rate was reduced three times, you would probably be hard-pressed to tell the difference and you'd be saving a lot of storage. The videos themselves have very good detail and run extremely smoothly thanks to the higher framerate. Focus is not overly active and generally accurate and we'd easily say this is one of the best 1080p camcorders on the market today. However, it still stands no chance against the 4K recording of the Galaxy Note 3. Here's an untouched 1080p@35fps (0:11s, 100MB) video taken straight off the Meizu MX3. The Meizu MX3 enters our video quality comparison tool confident it can take the LG G2 and Samsung Galaxy S4 head on. You can set just about every other smartphone as an opponent to the Meizu MX3 on the tool's page.